Welcome to the B-737 Flight Simulator «Babinda» at the AIR FORCE CENTER in Dübendorf. Are you a tourist or simply interested in flying? 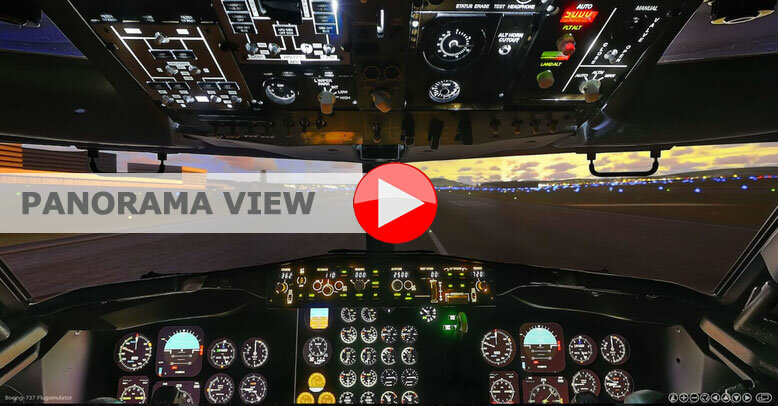 Have you dreamed of sitting behind the controls of a Boeing B-737? Or do you simply want to make an approach to an airport such as Zurich inside the cockpit? All of this is possible in an original flight cockpit of a Boeing B-737 which has all the functions of a normal airliner. Take-off on runway 28 at Zurich Airport heading west, followed by a 180° left turn heading south in the direction of the Pilatus and the military airfield in Emmen. Climbing to 17,000 feet at a speed of 230 knots we fly in the direction of the Bernese Oberland, past the Eiger, Moench and Jungfrau peaks, and then again make a left turn taking us along the Aletsch Glacier. Breathtaking scenery awaits the copilot as we head towards the Rhone Valley, past the Raron and Turtmann airports in the direction of Sion. Enjoy the fascination of an approach based on the IGS (Instrument Guidance System) towards Sion, followed by a go-around maneuver towards Lake Geneva. We continue along the right side of Lake Geneva, past St. Prex towards Geneva where we will make an ILS approach, land and then take off again. The flight then heads towards the Matterhorn region, back in the direction of Emmen, Einsiedeln and Schwyz as we make an approach from the south towards Zurich Kloten Airport, landing on runway 34. And all this in about 90 minutes flying time with you at the controls of this unique 60-ton jet!